Vaccines have eradicated smallpox, nearly eliminated polio, and have led to major reductions of serious infectious diseases. Due to these successes new generations are unaware of the risks of many vaccine-preventable diseases, and concerns now often focus on the individual vaccines themselves. The Social Sciences and Humanities Network (SSHN) is a multidisciplinary network regrouping social scientists and humanities researchers across Canada to examine the ethical, legal, and social implications of vaccine programs. SSHN projects focus on vaccine acceptance and vaccine hesitancy with the goal of generating evidence and approaches that will enable vaccination programs, healthcare providers, and policy decision-makers to address vaccine hesitancy and achieve greater vaccination acceptance. The SSHN members are Canadian and international leaders in research around vaccine hesitancy and acceptance. SSHN researchers sit on a number of federal and international committees, and their work is recognized as a theoretical basis for research in this area in Canada. Mapping vaccine hesitancy in Canada: Designed to provide a contextualized understanding of vaccine hesitancy and its determinants in Canada. Vaccine hesitancy in Canadian parents:Designed to develop an instrument to measure the prevalence of vaccine hesitancy in Canadian parents and to monitor vaccine hesitancy online using digital detection tools. Vaccine hesitancy: a “wicked” risk communication problem: Examined media coverage of vaccine preventable diseases and vaccination in order to measure how well news coverage informs public understanding. Vaccinating pregnant women: are maternity care providers hesitant? Investigated the determinants of Canadian family physicians’, obstetrician-gynaecologists’, nurses’, and midwives’ willingness to recommend and/or administer vaccines to their pregnant patients. Developing and evaluating public health messages to address vaccine hesitancy:Will identify which communication strategies show promise for reducing parental vaccine hesitancy, specifically looking at the role of narratives. Addressing vaccine hesitancy: pan-Canadian validation of an effective strategy:Will evaluate the impact of motivational interviewing on parents’ intention to vaccinate their infant and vaccine uptake at 12 months. Determinants of HPV vaccine uptake in school-based programs in Canada:Will allow to better understand the determinants of HPV vaccine uptake in school-based vaccination programs in Canada in order to identify promising strategies. Identifying effective communication materials to enhance vaccine acceptance:Will develop communication materials for enhancing vaccine acceptance that both follow evidence-based risk communication criteria and meet the needs and preferences of parents. Unpacking vaccine hesitancy among perinatal healthcare providers: influences on beliefs and practices. An ethnographic study that will explore vaccine hesitancy in maternity care providers and their perceptions of information interventions aimed at increasing their acceptance and promotion of vaccines for pregnant women and infants. Dr. Eve Dubé is a medical anthropologist. Since 2008, she has been a member of the Scientific Group on Immunization at Québec National Institute of Public Health. 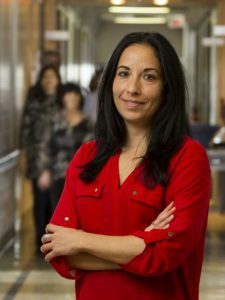 She is also a researcher at the Research Center of the CHU de Québec-Université Laval. She is an Invited Professor in the department of Anthropology and an Adjunct Professor in Social and Preventive Medicine at Université Laval in Quebec City. Most of her research focuses on the socio-cultural aspects of vaccination. She is also interested in vaccine hesitancy and doing various projects in that field. She was a member of the WHO working group on Vaccine Hesitancy. Vaccine hesitancy during pregnancy: Why are maternity care providers hesitant?